Panda On Ice is my first attempt at writing for Iris Wildthyme and her companion Panda. Iris appears in all sorts of formats but it’s Obverse Books who put out an annual collection of her misadventures in print. 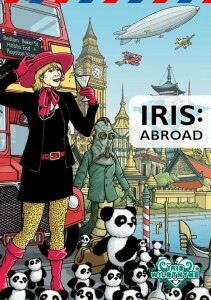 Iris: Abroad is their third anthology and I was delighted to have my story selected for inclusion. Despite the theme for this one, Panda On Ice is as close to home for me as it’s possible to get. As a Brit who has lived in Canada for the past twelve years, the land of beavers and ice hockey seemed a natural place to set my story. While Toronto isn’t abroad for me any more, it is for Iris. I wanted to mix in a flavour of what it’s like to view Canada with British eyes. The number one difference – or at least it used to be – is the intensity of Canadian winters. Originally I intended to write this story in January of 2010. I wanted to take the dog for a walk in the snow and freezing wind-chill and on returning home I planned to sit at the keyboard and really capture every last detail of a Canadian winter – to make my readers feel the need to go get a jumper and maybe turn the heat up a notch. Well that was my intention. As it turned out, the winter of 2009/2010 produced less snow in Toronto than any I’ve experienced before. Oh sure it was cold, but as for the crisp white stuff: nary a whisper. Meanwhile in Britain, most of the country was paralyzed by intense snowstorms! The photo albums of my British friends on Facebook now resembled pictures posted in previous years by the Canadians. So this story was a challenge to write, partly because I wasn’t able to draw on immediate, visceral details as I had intended and also because I find Iris incredibly tough to write for. To many writers her voice comes naturally. To me, it’s bloody hard work. I keep descending into farce. While Iris is a larger than life character to be sure, she also has an intensity and wit that I find hard to capture. My dear editors will politely disagree with my self-assessment on the first draft I turned in. Possibly one of the weakest pieces of writing I’ve produced in a long time. It was, frankly, dreadful. I felt like I should hand in my writer’s badge and shut down my word processor for good. With some excellent feedback from the editors and after a thorough, top-to-bottom rewrite, I was a lot happier with it. I also employed a little trick that has served me well in the past. Panda on Ice involves children who are kidnapped and incarcerated and is pretty harrowing to think about. I knew I wasn’t going to be able to shy away from the reality of the situation, so I tried to write about it in the same way I might describe a person going to the supermarket to buy eggs. By not making a song and dance about the nature of the imprisonment or the fact that children are the victims, I think it lends the piece a more chilling vibe. I tend to feel a situation like that speaks for itself. Describe the details, add in some simple – yet hopefully believable – reactions from the victims and those around them and let the reader fill in the horror for themselves. I’m a strong believer that the prose itself should not be signalling to the reader that it’s time to be disturbed or shocked. It’s a technique that’s worked quite well for me in the past. I’ve been pleasantly surprised by the reactions to sad or shocking events in previous stories I’ve written. In those stories I’ve tried not to tell the reader that the situation was sad or play up the sympathy angle. I just presented the facts in a straightforward fashion and wrote about the reaction of the victims and their friends and family in an honest way, and it seems to work. In these situations, less is more. It comes down to “show, don’t tell”. I try to let the actions and reactions of my characters do the talking rather than have the prose trying to create an artifical response. If characters react believably and honestly then the reader will stay with the story and experience what they go through. If you tell them it’s time to be scared, they’ll feel manipulated. The handful of reviews have been very positive about the collection as a whole and all seem to like my story, which is a huge relief let me tell you. Here’s an excerpt from Nick Mellish’s review of Iris: Abroad. I love this review, even though there’s only one sentence about my story. But it captures exactly what I was going for. In the end, the reviewer was surprised at having an emotional reaction to the story. I worked hard NOT to have the story work hard, if that makes sense. I wanted it to creep up on the reader, make them feel uncomfortable and draw them into sympathising with the characters. So in the end the last scene triggers an emotional response they weren’t expecting to have. It won’t work for everyone, but for Mr Mellish it seems to have succeeded. That’s great news. This review on Goodreads was also a pleasant surprise. Extremely enjoyable selection of short stories, with only a couple of misses for me. Indeed I suspect that this is probably the strongest Obverse collection of Iris and Panda short stories yet, probably helped in no small part by the suitability of the book’s theme for the characters’ adventures. My favourites in this collection were The Midnight Washerwomen by Scott Handcock, Panda on Ice by Richard Salter, Couch Potatoes by Scott Liddell, and The Best Holiday Ever by Ian Gregory. I believe the correct terminology is, “Woot!”, though I’ve no idea what that means. Daniel Tessier of “The History of the Doctor” provided a very positive review of the collection, which included the following about my story. Chilling in more than one sense is Panda on Ice, which places our heroic pair in deep frozen Toronto. By tackling the absurdity of a sentient stuffed Panda head on, Richard Salter overcomes the issues this may cause to create a story with some rather uncomfortable moments, as young children begin to vanish with a horrific explanation. Since my last post in this thread, I now own all the Iris collections that you’re capable of selling to me. So even when I go in with my Grumpy Critical Hat on, there’s always at least one slice of fried gold to keep me gleeful. 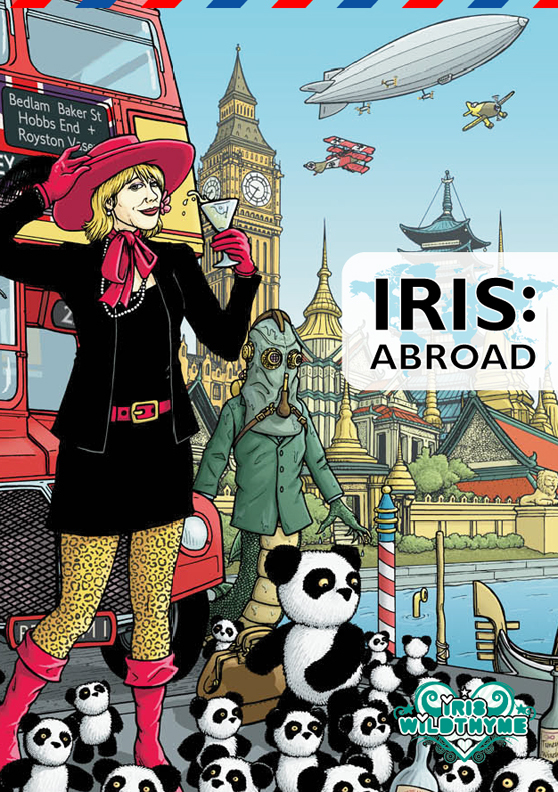 Like “The Story Eater” and “Panda on Ice” in Iris: Abroad. That latter of which was written by Richard Salter, who I see is involved this time as well…. Go ahead! It was a story that took me utterly by surprise with each little twist, and then shocked me all the further by going through with it without “reset”. Lingered long in the memory…. Clearly I didn’t learn from my experience of writing Panda on Ice and the editors thankfully have selective amnesia when it comes to that first draft, so take a gander at my forthcoming story in the next Iris anthology, Wildthyme in Purple. Before you go, check out the full wraparound cover artwork in all its beauty. 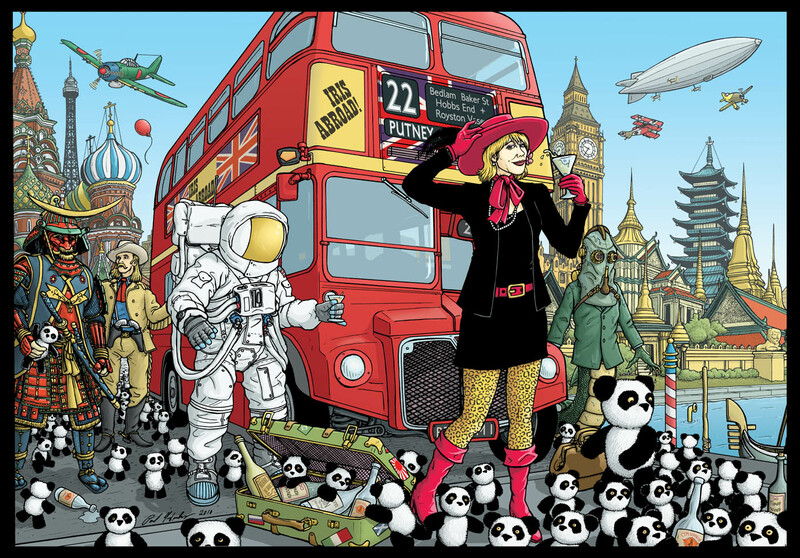 You can find more of Paul Hanley’s amazing work here.